The horn of Africa crosses of serious crisis caused by a drought which threatens about 1,5 miliion chilren of less than five years. The absence of rains for two years destroyed the harvests,killed livestock and caused the disappearing of sources water.In Somalia, which is the most affected country by drought,where more than 8 million persons are in serious danger following a destructive drought. This caricature is named "The New Old Mc Donald's Farm". It was made by A. Singer in 2006. In the foreground, I can see a man on a tractor with a big suit. Behind this tractor, there is a tank with a skull with a tap which spray salad. In the background, There are beefs on a travelator whiches go to an house with the radioactive symbol on it. Everywhere in this caricature, there are salads in the farm. The man is singing a readaption of a famous american song. This song is supposed to be a children song, with pigs, cows, ducks... In this version, the farmer replaces animals' names by terms like: Pesticides, Genetically Engineered Crops, Arradiated Beef... He uses the same positive melody to speak about chemicals and factory farming. We can imagine the tank sprays with pesticides because of the skull. Behind, beefs are going to become irradiated beef. 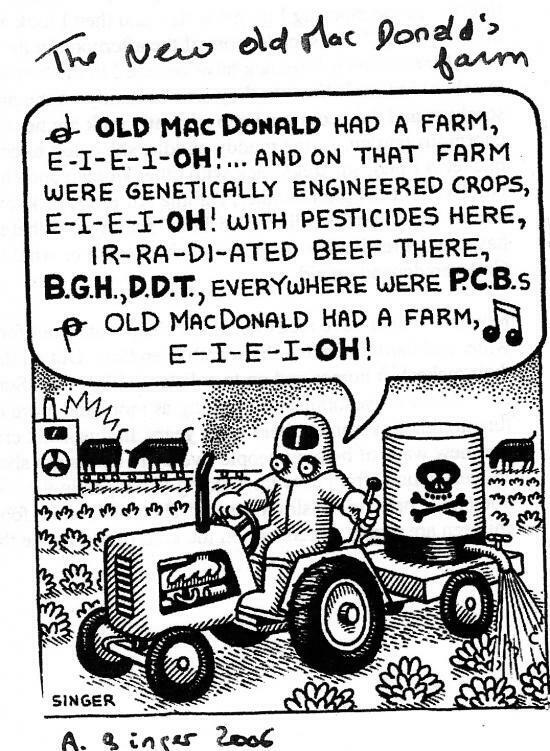 With this caricature, the cartoonist, A singer, criticizes farms of today. He uses humour with a readaptation of a famous child song, and he changes it remplacant animal's terms in chemical's terms. I like this caricature because I knew the real song before our work on this caricature. I think this caricature is not an exaggeration when we learn rivers are polluted. Furthermore, this caricature is easy to understand and to explain.